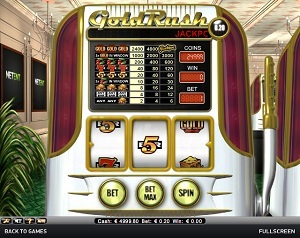 Gold Rush is a classic online video slot machine game from Net Entertainment that was released in December 2010. This video slot game has 3 reels, 1 pay line, but it is a progressive jackpot slot. Gold Rush is inspired by the frenzy of gold rush, which means it is a time of vehement migration of people to a place that has had a remarkable discovery of gold deposits. Major gold rushes took place in the 19th century in the US, Canada, Brazil, South Africa and Australia. Digging for gold is an extremely difficult task, with no assurance that you are really going to find gold and strike it rich. However, in the Gold Rush slots game from Net Entertainment, you would definitely like to stay a while and try to nab that jackpot! A nice attribute about Net Entertainment is that they allow everyone to play instantly on their online slot machine games, without the need to download anything at all! With a progressive jackpot, no fancy stuff to remember, Gold Rush is a classic slots player’s ideal slots game! Even if Gold Rush seems like a very simple online video slot game, Net Entertainment tries to please each and every one of their players. The graphics are simple and seems okay. When you play the game, your slot machine is surrounded by other slot machines and you are somewhat in a casino room with potted plants, patterned carpet and lots of chandeliers above your head. Since it is basically a no-frills kind of slot game, Gold Rush has been designed to imitate a genuine casino ambience with matching sound effects, which makes you more convinced that you are in a casino playing an old-school 3-reel slots game. The casing of the reels include the paytable, reels and buttons and coin display with a big pull arm on the right and a mahogany finish on both sides. The slot machine they have used may remind you of an old jukebox that also looks like a fridge. The icons or symbols used will make you nostalgic as it includes cherries, 5 bars, 7 bars, mining carts, bar icons and gold logos. The overall graphic design of Gold Rush displays colors such as green, red, peach, and of course, gold. Since it is a fairly simple slots game, Gold Rush does not have too much sound effects. There is no background sound except when you pull the lever and you will hear a sound similar to the slot games that are on a real land-based casino. When you hit a winning combination, you will hear the sound of coins clinking as you get paid out. In Gold Rush, since it is a fairly simple slots game, there are only 5 regular symbols available such as the Gold symbol, Cherry, Seven Bar, Five Bar and the Gold-filled Wagon. Other than the symbols mentioned above, Gold Rush does not have any Wild or Scatter symbols. Gold Rush does not have a Bonus Feature game, but they do have a progressive jackpot to flamboyantly reward their valued players! A progressive jackpot is described as a continuously-accumulating prize, and the most recent value of the Progressive Jackpot is showcased in the Gold Rush slot game. In order for you to be eligible for the Progressive Jackpot, you must wager the maximum bet and you must get 3 of the Gold Symbols on the pay line. Take note that only Real Money Players are eligible to win the real money Progressive Jackpot. Do take note that the Jackpot counter may be shown in a currency other than what you are playing in. If in case you won the Jackpot and you are playing online casino games that display a different currency, the total amount that you’ve won is then converted to the currency in which you are playing, and then it is included into your total account balance. Gold Rush is an online video slot game that has 3 reels and only 1 pay line. Gold Rush is a progressive jackpot slots game, which means that every time it is played, a portion of the player’s bet is added to the total Jackpot. The only coin value is 0.20, but you are still able to wager from 1 up to 3 coins. Gold Rush comes with an Autoplay function so that online slots players can set how many spins would like to play automatically. They can select how many spins that the Autoplay will spin automatically for them. It can be from as low as 10 up to as high as 1000 automatic spins! After choosing how many number of spins they would like, simply click Start and the game will spin automatically for them.